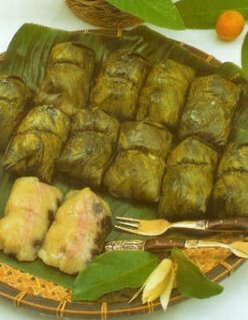 Kin Jay (Vegetarian Food): Thai Bananas in Sticky Rice, "Khao Tom Madt"
Khao Tom Madt or Thai Bananas in Sticky Rice is local famous Thai Food, in every Thailand city and village. This menu for vegetarian and most famous of Thai food. The people know and love “Khao tom mad”. It's a vegetarian food too, so according to our sources it may be impossible to find a Thai person that does not like eating it. Although it's a dessert recipe, this is very filling and could be served as a main course. The black beans are optional. It’s easy for cooking. And then use in period Kin Jay festival. - 8 pieces banana leaf or aluminum foil, 6" x 10"
1. Soak the glutinous rice in water overnight, then drain. If you want to include the black beans soak them overnight also and boil until soft. Combine coconut cream, sugar and salt in a separate bowl and stir until ingredients absorbed. 2. Put all of the drained rice in a nonstick pan on low heat, and very slowly add the coconut cream mixture while stirring with a wooden spoon. 3. Keep stirring over simmering heat until the rice is tender and all of the coconut milk is absorbed. This may take up to one hour, be patient and make sure the coconut milk is absorbed. Let cool. 4. Put a small amount of rice on a banana leaf and mix with black beans. 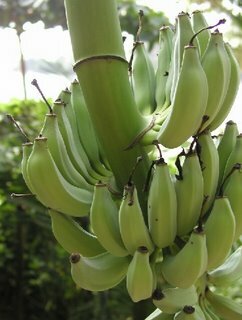 Place a banana on top, cover with more rice and beans, the fold up the leaf and tie securely. Repeat until all bananas are used up. 5. Steam 15 minutes, cool, unwrap and serve. Enjoy your Thai vegetarian food.